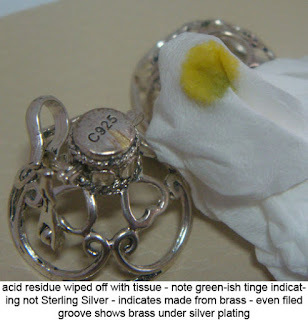 Are you really getting Sterling Silver? 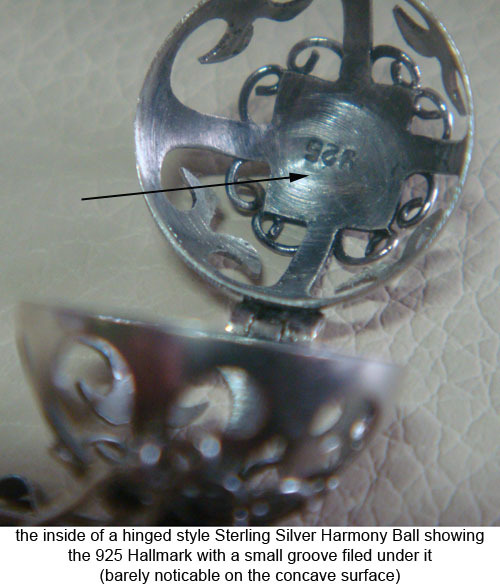 As it is with many other items Chinese manufacturers are producing ‘copies’ of Balinese Harmony Ball pendants (and have been for many years now), and the deception is that these copies are NOT made from Sterling Silver – they are merely ‘coated’ with sterling silver. These Harmony Balls are made from a poor quality Brass alloy or Alpaca, a low grade material made from a hotch botch of minerals (often passed off as Sterling Silver) and then coated. 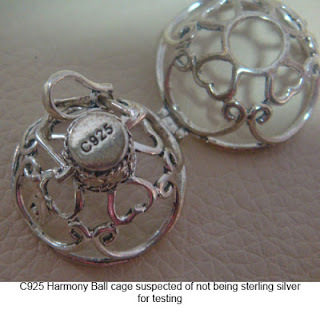 These fake sterling silver Harmony Balls are found on all types of sites on the internet, some are big name reputable sites. 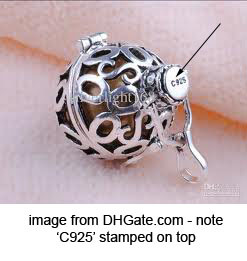 Many, but not all these days, are stamped ‘C925’ on the top of the stem where normally on a genuine Balinese Harmony Ball would be set a gemstone. 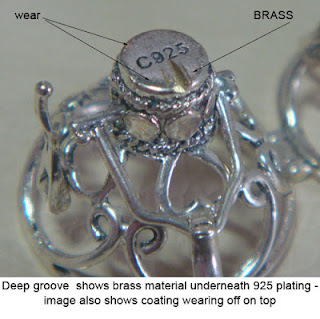 The mark ‘C925’ indicates ‘coated with 925’ BUT no-one else in the world does this or uses such a mark so it is very deceptive, most people assume it means 925 Sterling Silver. 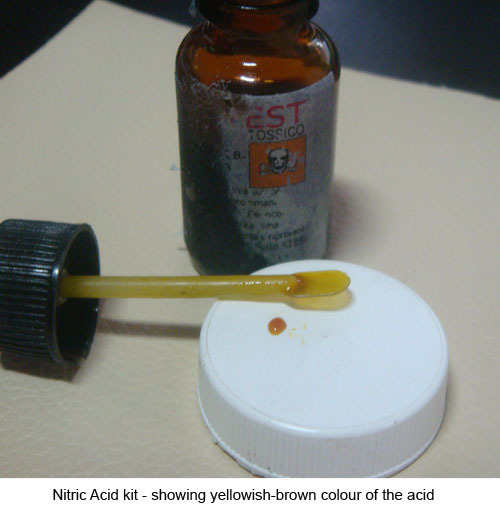 Some ‘fake’ copies do not have the stamp at all as some Chinese manufacturers realize that the ‘C925’ deception is less impacting these days. They are now even producing Harmony Balls that also have ‘fake gemstones’, using cheap crystals instead of real gemstones. These non-genuine Harmony Balls look good and seem to be of reasonable manufacturing quality but they lack the ‘hand crafted’ appearance of a genuine Balinese Harmony Ball crafted by a village silversmith with skills passed down through generations – these copies look ‘manufactured’. 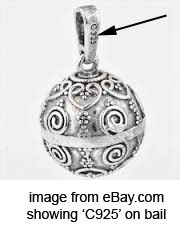 To the trained eye these fake Chinese Harmony Balls are easy to pick and many lovers of Harmony Ball pendants will easily pick the fakes once they read this article and see some of the images. 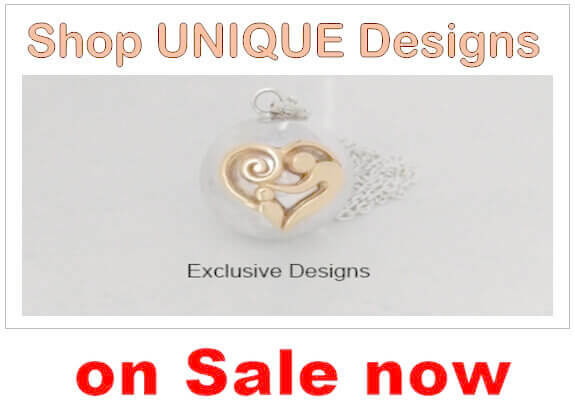 The copies were originally focused on the hinged cage style of Harmony Ball but now are including the ‘solid’ style, heart shapes and others. 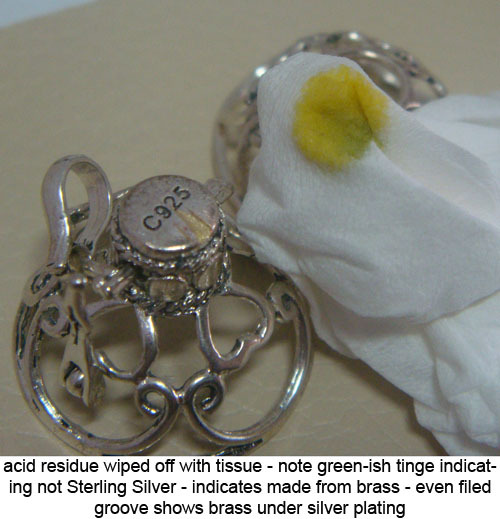 The issue is that as a consumer you are being deceived in many cases by the presentation of these copies in the description as ‘Sterling Silver’, ‘C925’ or even just the term ‘Silver’ which to many people is assumed to be Sterling Silver (many people refer to Sterling Silver simply as Silver, even Jewellers and jewellery stores). The fact that these fake Harmony Balls look good and actually chime does not negate the fact that you are not getting what you paid for, not getting what you thought you were getting. The other important thing is that the 925 ‘Coating’ WILL WEAR OFF eventually. 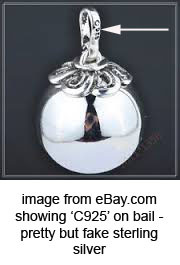 So how will you determine from visiting a website and looking at images if the product offered is a genuine Balinese Sterling Silver Harmony Ball actually made from Sterling Silver? 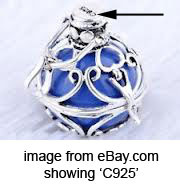 The ‘trust’ factor is important but do not assume that a ‘trusted name site’ does not offer non-genuine harmony balls. 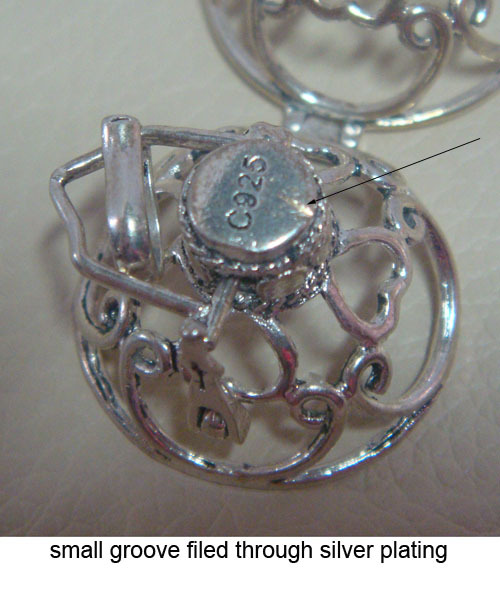 Primarily looking at the description of the item is a good indicator – if the description is very brief and just uses the term silver, or avoids using any description of the material that the item is made of then it may be that ‘not saying’ what it is made of then lets you the customer assume that it is sterling silver – one form of deception. 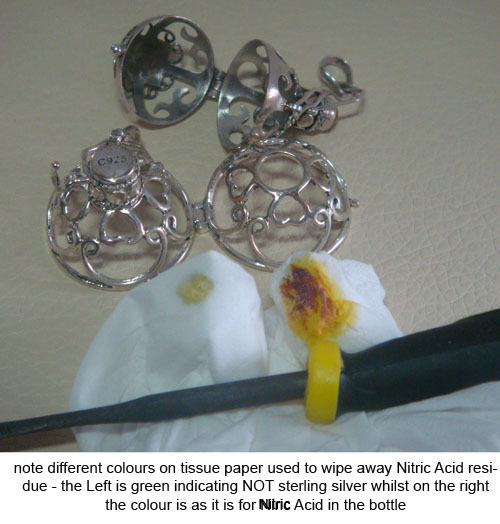 Look at the image(s) – compare them to some of the images contained in this article (and soon in an image library specific to this issue). 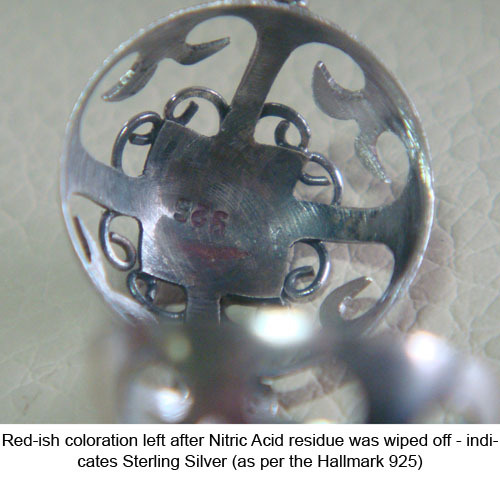 Aside from some images showing the C925 or the ‘Harmony Ball’ words stamped on the bail, take a good look at the color of the so called sterling silver – it lacks the typical ‘lustre’ of sterling silver and is far too grey (gray) looking. The coating process which utilizes chemicals and electrical energy generates factors that unavoidably discolours the sterling silver used as the coating material causing it to be much greyer than it should be. (photographic technique also comes into play with images). The best determination can be made by looking at the description, the images and the price. 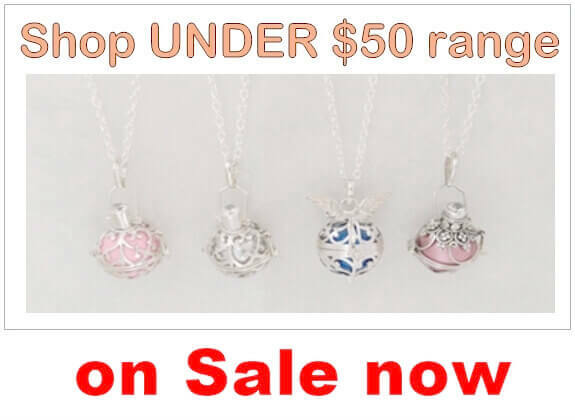 If a particular style of Harmony Ball ‘averages’ between say $35 and $45 and one you see is very similar but only $25 then buyer beware – like the old saying, you only get what you pay for. 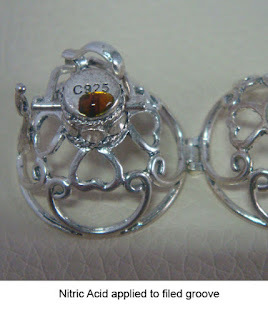 If you want to be really sure you are getting genuine Sterling Silver and genuine Gemstones then maybe take a look at the Harmony Ball sites recommended by this blog as a starting point. 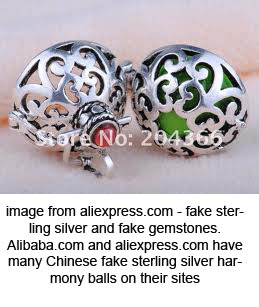 Many, many ‘reputable’ websites are selling these Chinese manufactured fake sterling silver harmony balls. I have tried NOT to purposefully name and shame any of these sites however I have borrowed some of their images for the purpose of examples of what is being sold online. 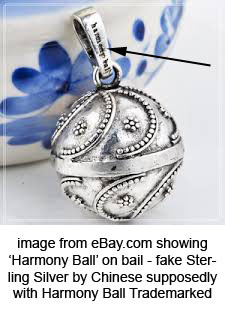 I will make this statement very clear – ‘just because a site is selling ‘non-genuine sterling silver’ harmony balls does not mean that they are doing so intentionally nor that they are intentionally attempting to deceive consumers by intentionally misrepresenting the product. 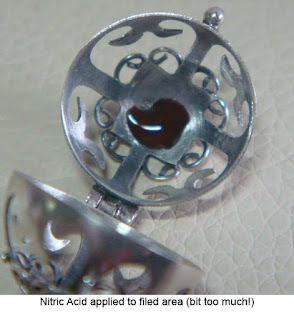 The Chinese manufacturers are very clever in their deceptions, not only in the specifics of a product but also in their representation of the product to their customers (wholesalers and retailers) so in many cases the websites selling these products may be unaware that they are not made of Sterling Silver (Chinese manufacturers have been known to send genuine items as samples then subsequently supply copies). The opposite can also be true in that some retailers are making huge profits by knowingly selling non-genuine product. 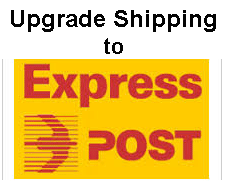 As much as sites like eBay, Etsy and similar have strict rules about what is sold by sellers on their site(s) they have the issue in that they cannot control the way a seller on their site describes the product(s) they sell on that site. Non- genuine sterling silver harmony balls proliferate on sites like eBay, Etsy and similar for the above reason. Having said that there are many, many sites that can control this content and choose to mislead customers, or put another way, not inform them. Again let me be clear on this – it is generally what sellers are not saying that is the problem, just saying enough to have a customer ‘assume’ what is the accepted norm – deception by exclusion. 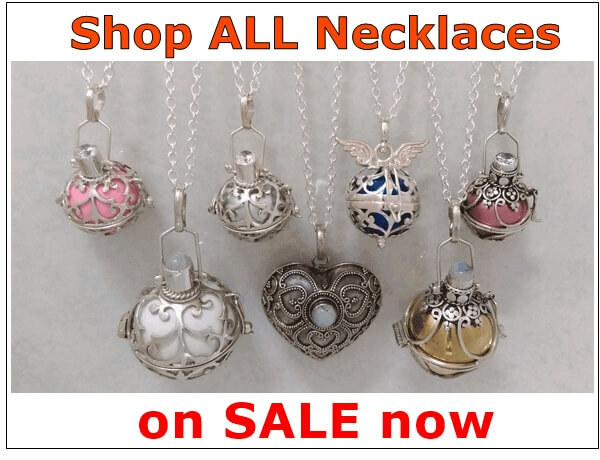 Please enjoy your shopping for your Harmony Ball, we are sure you will find that special angel caller or bola necklace here in our site. 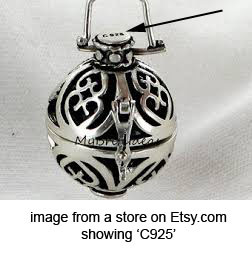 Author: Mike OShannessy – is an authority in Harmony Ball pendants with many years experience dealing with Balinese silversmiths. This article is protected by copyright. The images used in this article are used as reference to ‘C925’ and the Chinese ‘fake sterling silver’ harmony balls and are not designed to reflect on the source of the images – these images were sourced via Google Images Search. 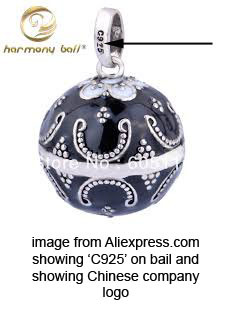 It is fair to say that sites like DHGate.com and Alibaba.com / Aliexpress.com appear to promote only Chinese Harmony Balls.